I was blessed to be in the company of two very special women. My beautiful wife of over 21 years, Jane. And Hilary Mwelma, otherwise know by her stage persona, Hil St. Soul. The latter was there as the host and star of a special intimate night of musical entertainment taking place onboard the historic Cutty Sark ship in Greenwich, South East London. It was a truly beautiful night and Hilary had both myself, my wife and all the other lucky spectators in the audience captivated by her beautiful performance and selection of songs for the night. As a longtime fan of ‘Hils’, it was actually the first time I had seen her perform live, and I came away feeling inspired and humbled by the experience. It gave me cause to pause and reflect on how much pleasure and enjoyment I get from musical artistes such as Hil St. Soul, and especially made me realise how much more I tend to listen to female artists more than male. 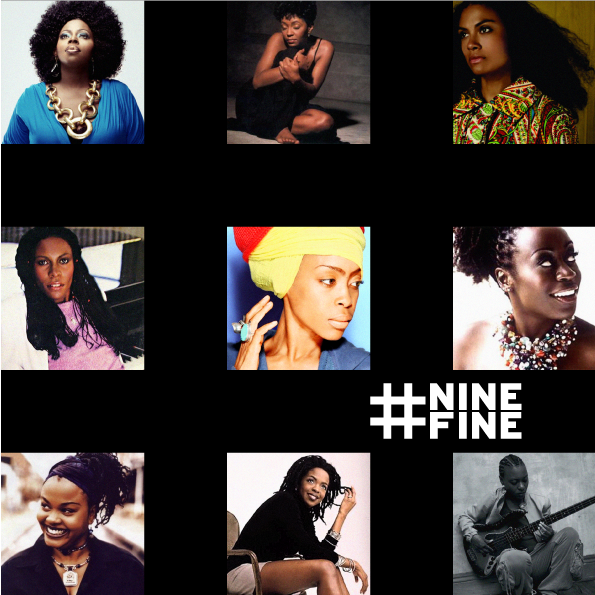 Here’s my selection (in alphabetical order) of favourite tracks from nine of my favourite soul sistas. My humble way of paying tribute to these amazing women. Thank you for blessing me daily with your deep, beautiful, intelligent, powerful, unique musical voices and extraordinary lyrical talents. As October and another British Black History Month draws to a close, it gives me cause to reflect on the years since its inception in 1987. Culturally and technologically the changes in our society in that time have been immense. However, politically we seem to be going backwards rather than forwards as our basic freedoms and human rights come under constant attack and outrageous acts of prejudice, racism and violence become increasingly flagrant and frequent. Back then in the ’80s, our profiled creative for this month was making his mark as a graffiti artist and rapper as part of London’s burgeoning hip-hop scene. Creative roots which fed and nurtured him into one of the most talented, diverse and respected artists and designers of his generation. His integrity to his craft and commitment to his community, especially in encouraging young people, is awe-inspiring. As is his vast body of work encompassing art, design, illustration, photography, film, sculpture and music. But let’s be clear, this is no “Jack of all trades”. His work in each and every discipline he turns his heart and his hand to, is accomplished and features many landmark projects, which continue to influence to this day. So without further ado, let’s pass the mic to Mr Benjamin Wachenje aka Bro Ben. I grew up in Harlow on the outskirts of London. Being born in the mid-70s meant that I was just about old enough to be considered a first-generation hip-hop child. From the first time I set eyes on Malcolm McLaren’s Buffalo Girls video as a young boy I became submerged in hip-hop cultural expression. Although I enjoyed all of the various disciplines of the emerging hip-hop movement I found the spray can art element particularly fascinating and exciting to do. Spray cans only represent a medium but the art form is essentially typography fused with figurative and landscape painting on unconventional canvases. As a result of this early introduction into the combined arts I have continually resisted the notion that you have to specialise in one discipline. During the mid-90s I was fortunate enough to have been the first generation to be offered the opportunity to study for a ‘joint’ honours degree at The University of The Arts’ Camberwell site. So I chose to simultaneously study Fine Art and Graphic Design, where I furthered my understanding of layout, composition, photography, typography, painting and printmaking. Prior to studying for a degree I had already satisfied many illustration and design briefs in the late-80s and early-90s. Before having computer access I had learned how to cut and paste using Pritt Stick and a scalpel, delete and tidy work with Typex and do laborious-hand rendered typography with Gouache paint or Letraset transfers. With regards to my illustration style, prior to owning a computer I would collage sheets of coloured paper together to make Illustrations. I got my first Mac in 1997 after volunteering at Alarm magazine. As a reward for my hard work and sleepless nights meeting press deadlines the publisher kindly gifted me an Apple Macintosh Performer 5600 Power PC. I quickly developed a technique to create my collaged paper illustrations in Photoshop. I had my first illustration published in VOX magazine in 1997 and this was followed by regular appearances in Echoes Music Weekly and Touch Magazine. In 1999 my illustration helped to enrich the branding of the DarkerThanBlue digital platform. After two years at DarkerThanBlue I returned to Touch Magazine as art director and also worked as art editor for THE FLY magazine. I had hundreds of rejected job applications after leaving university. While being unemployed I would occupy myself with imaginary briefs. I started to take the job application process less seriously and began to take risks with my covering letters which accompanied my CVs. On several occasions I just wrote raps/poems and I was surprised to find that this strategy appealed to some of the recruiting art directors who found this interesting and funny. As a result I became a frequent freelance designer at both Emap and IPC publishing houses. I also underestimated the power of referral. At least 50 per cent of my early work leads came from one friend, Russell Moorcroft. He was comfortable in putting me forward for a number of jobs because I had been at college with his wife Linda, who was able to give a confident character reference about my work ethic. But now the greatest challenge I face is to work as hard towards my own goals as I have in the past towards the visions and goals of my paymasters. Most definitely hip-hop culture has been a great inspiration and has interfaced me with enriching experiences. But professionally my early mentor Everton Wrightshifted my paradigm as to what is possible. I had never come across a black man with dreadlocks who drove a nice car and owned a consultancy and design studio (Creative Hands) in the heart of the City. The walls of the studio were adorned with examples of high-profile work that overlooked the minimalist furniture, wooden floorboards and first generation G3s and iMacs that were dotted all over the loft-styled workspace. What’s more he had staff and was able to pay me. It was a mind-stretcher to say the least. I had never met a black man in Britain who had carved out a living for himself like that and being of black British descent this really resonated with me. Aside from that type of up close and personal inspiration I also take a holistic approach to the arts as a whole, so I might do a painting inspired by the music of Donald Byrd. I might do drawing inspired by Spike Lee’s films. I might make a short film inspired by a poem I have written. I might design a palette for a corporate brand based on a Monet pastel drawing. I also find inspiration in failure, depression and tragedy. I know that I am at my happiest when I am productive. I know that if I am not productive I will be depressed. I know that if I don’t find a lesson in a tragedy then the sorrow may envelop me. I know that if I don’t analyse my failures I will be destined to repeat them, so I stay positive and draw inspiration from life’s beauties and hardships. I am not a proud person. Sometimes I like my work momentarily on completion but as time passes I can only see how it could have been better. I get very uncomfortable when people praise my work. My dream job would be to direct and produce a feature length film. As an artist without boundaries what better medium exists than film, to harmonise the spectrum of artistic disciplines? Within film you can fuse, literature, poetry, music, sound design, dramatics, theatre, dance, sculpture, photography, typography and graphics… I think the great filmmakers of this period will be remembered and revered in the same way we idolise the renaissance painters of the 15th and 16th Century. As previously mentioned Everton Wright. Steve McQueen. His work asks questions in a subtle way. Also he feeds into the growing audience that want to see an unconventional artistic approach to film making. Kjell Ekhorn and Jon Forss (Non-Format). They don’t follow design trends and they have enough confidence in their vision to establish trends. Graham Rounthwaite. Editorial illustrations were seemingly becoming stagnant before he re-energised the discipline with his fresh fashion-led stylised characters that he placed in familiar urban contexts. Taki 183 and PHASE 2. Fathers of graffiti who were some of the first Street artists to break the cycle of incestuous, elitist art and bring it back to the everyday people. Blek Le Rat. The relatively unknown Parisian stencil artist, whose work inspired and pre-dates Banksy. Following a period of abstract impressionism art was losing its ability to communicate with the masses and could no longer effectively critique power or voice decent. With the emergence of Culture Jamming and Street Art once again artists like Blek Le Rat were able to comment on the social and political climate in a dissident and subversive visual language. Don’t follow in my footsteps – create your own pathway. If you try to get to where I am you will be disappointed when you arrive. Never limit your goals to what someone else has achieved, look beyond, focus on personal excellence. Try to be excellent at what is in front of you right now and then move on when the time is right. A workout. I have been sitting in front of my computer all day. Not good. You have to paint up close but then view from a distance to find out if your strokes are making sense. When I work out I can reflect on my creative goals from a distance. But for sure I will continue to illustrate, art direct and make space in my schedule to make films. KERRY JAMES MARSHALL ‘LOOK SEE’ – an exhibition of new paintings oncurrent with the traveling exhibition Kerry James Marshall: Painting and Other Stuff, currently on view at the Fundació Antoni Tàpies in Barcelona and the Museo Nacional Centro de Arte Reina Sofía in Madrid. Runs until 22 November at David Zwirner Gallery, 24 Grafton Street London W1S 4EZ. Visitthe website for more information. According to the lyrics of the late, great pioneering Afrobeat musician and cultural icon, Fela Kuti, ‘Music is the weapon of the future’. If that’s the case, then this month’s profile designer’s work is a laser cannon. There are very few artists and designers, whose work transcends merely being the superficial packaging of the music, and becomes the visual embodiment of it. And Lemi Ghariokwu, or Lemi G as he is often known is such an artist. As a pioneering sleeve designer in his homeland of Nigeria, he has created an enduring legacy of highly potent, and political visual statements that gave Fela’s music added power and impact. So let’s hear it from the man himself in his own words. Shoot Lemi G.
I’m a self-taught fine artist, graphic designer and illustrator. I did not receive formal training from an art school so I’m coming straight from my heart and soul through the streets into the arts. No degrees but I got pedigree! That’s my background. Destiny is the key to my life and pre-destination unlocked when in 1974 I did my own version of a Fela Kuti cover as practice. A journalist saw my cover, was impressed and took me to meet Fela. Soon after I had the opportunity to do my first Fela cover, which received rave reviews and gave me instant recognition. I was then a teenager seeking my path in life and Fela pointed me in the right direction to become a professional record sleeve designer. In the early days, I used to be commissioned do live drawings at TV studios. My first ever cover design was for my uncle, Peter Okoh and his band, Patience Rhythm Dance Band for Decca Records in Africa, but unfortunately it was never published. So officially, my first published record cover was for an album called World Affairs by an artist called Tessy Allan. I’ve worked with many musicians all my life. I would have been a musician if it wasn’t for the Art. The first challenge was to school myself to acquire the skill to be very professional in my work. I checked out any arts and designs I came across, asked questions from experienced artists and designers, did short stints in three advertising agencies in a bid to overcome the challenges. As soon as I was ready, my association and eventual collaboration with Fela Kuti put me on a pedestal and a very good footing to achieve one of my ambitions as the pioneer of professional record sleeve designer in Nigeria. I’ve made a career spanning 40 years of this. I’ve always been inspired by things around me; everyday movements of people, state of the nation and the world at large. My greatest inspirations and influences come from individuals who are advocates for equality and justice, contributors to the advancement of society and human progress and most especially facilitators and catalysts for positive change. Also, I fell in love with album sleeve design while at secondary school. The album ‘Woyaya’ by Osibisa was the first to catch my attention. Designed by the renowned British sleeve designer Roger Dean, I was inspired by his other works such as the logo and album artwork for groups like Yes. Back then, only in my wildest dreams could I ever imagine I could become a record sleeve designer too. I also loved the album cover artwork of the acclaimed p-funk, Parliament-Funkadelic cover artist, Pedro Bell. Many people have suggested to me that there is a strong similarity in our work. Well, I have many ‘best’ pieces of works! My mostly proud of project is the body of works of 26 album cover designs I did for Fela Kuti’s musical career. I’m very proud of the Fela Bus, a mural on wheels I did for the Fela On Broadway show. Being a part of the Kalakuta Museum project as the curator is also a shine! My dream project would be to have a platform on a TV reality show dedicated to discovering and nurturing talents in visual arts and design. This I believe will help to promote visual art and design as a laudable profession and encourage individuals born with artistic talents in my society. Honestly I’m not sure I know anyone and that is sad, but let me explain. Things are different in Nigeria. When I started, I think I was the only one doing what I do. There were other artists, who worked for the likes of advertising agencies etc… as illustrators, but the few there were seem to have all disappeared. Nowadays, you have people who are not necessarily artists, but are technically-minded and computer literate, creating album cover designs. They tend to work from their own photography in cyber cafes, manipulating the images and creating the designs for many of the new breed of Afrobeat performers and recording artists. Frustratingly, they never seem to credit their own work on the sleeves so you never know who they are. My best advice to anyone is not to follow in someone else’s footsteps but to learn from their story. First and foremost, you need to find out who you are. Self-discovery and mastery is the key to life. Check out what you are really good at or what your strongest flair is. Work vigorously on developing that talent by honing your skills. Be consistent, principled and ambitious. May time and chance meet you at the point of your need for opportunity to shine. Good luck! I keep working to remain relevant and very contemporary doing avant-garde works in a bid to consolidate my legacy. For 2015 I’m planning to publish my memoir and have a retrospective exhibition to mark my diamond jubilee. DISOBEDIENT OBJECTS. From Suffragette teapots to protest robots, this exhibition is the first to examine the powerful role of objects in movements for social change. It demonstrates how political activism drives a wealth of design ingenuity and collective creativity that defy standard definitions of art and design. V&A Museum, London. Exhibition runs until 1 February 2015. AFRO-POLIS will be hosting alongside the Frieze Art fair, a 5 days experiential exhibition (15 – 19 Oct 2014) entitled – the African Renaissance. Held in and around Hoxton Square at various locations including the iconic former White Cube Gallery once the home of YBA Artists such as Damien Hirst and Tracey Emin. In addition to being able to see and buy art and design by some of the leading African artists and designers, The African Renaissance features an innovative and interactive set of activities, which include workshops, debates, panel discussions, keynote lectures, live performance, and themed dinner. Click here for more information on purchasing tickets. IMAGINARY POSSESSIONS: The first substantial presentation of his recent work at a U.S. museum by pioneering filmmaker, director, and theorist, John Akomfrah. ‘Imaginary Possessions’ presents three distinct films and a new commission that deftly excavate the fragmented identities of colonial subjects while challenging the received codes of cinematic representation. Runs until February 1st 2015 at the Eli and Edythe Broad Museum, East Lansing, Michigan 48823. DESIGNING AFRICA: Exploring Provenance and Materiality interrogates two particular areas of design – visual communication and material exploration. Designing Africa showcases the work of visual artists Momodou Ceesay, Clari Green, Pwavidon Mathias and Brian Omolo with origin as the underpinning theme. How do we define where we come from? By communicating their origins, present, future and imagined states they redefine the identity of Africa through printmaking, graphic design and illustration. THE TRINIDAD & TOBAGO FILM FESTIVAL (TTFF) 2014: Founded in 2006, the trinidad+tobago film festival (ttff) is an annual celebration of films from and about Trinidad and Tobago, the Caribbean and its diaspora. The Festival also screens films curated from contemporary world cinema. In addition, the ttff seeks to facilitate the growth of the Caribbean film industry by hosting workshops, panel discussions, seminars, conferences and networking opportunities. Festival runs 16 – 30 September. visualintellectual. RSS feed. Blog at WordPress.com.